This article addresses a dilemma in relation to researching children’s thinking and concept formation as an intentional process of competence acquisition and at the same time seeing children as persons in their life contexts, where the researcher also is a participant. Davydov’s concept of theoretical knowledge and thinking helped me to tackle this dilemma as a dialectical process of moving from the general to the particular and back again by analysing children’s concrete social situations starting from the societal conditions, then examining institutional objectives, and children’s motive orientations in activity settings—in order to gain an understanding of children’s social situations in their everyday activity settings. In this article, I illustrate the problems of getting knowledge of children’s conceptual and motivation development, by drawing on several of my research projects to illustrate, through my own biographic development, the dilemmas that psychology has to overcome in studying children’s activities in their different social situations. The discussion particularly relates to the potential demands of the situation and children’s motive orientations in these situations. 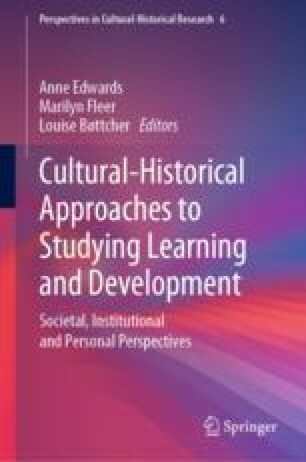 This chapter first appeared as an article in Learning Culture and Social Interaction and appeared online in 2018. The editors are grateful to the editors of the journal and to Elsevier for permission to reproduce it here.